Cold weather can wreak havoc on your vehicle. Don’t wait until it freezes – winterize your car or truck with these expert tips from Turtle Wax. Remember to check the air pressure before and during winter months to ensure the best traction and mileage. Once your tires are in good shape, apply tire cleaner and coating such as Turtle Wax® Wet’N Black™ Ultra Wet Tire Shine to help repel winter elements for months! Wax On, Winter Off: Winter weather can dull your car’s paint and shine, making it susceptible to rust and oxidation. To keep your vehicle clean and protected all winter long make sure to thoroughly wax your car before the cold weather hits. For best results, wash your car with a product like Turtle Wax® ICE ® Wash and follow with Turtle Wax® ICE® Liquid or Paste Wax to protect your vehicles surface from road salt and snow. Concentrate on the lower parts of your car such as behind the wheels, quarter panels, and front grille where ice, snow and salt hit hard and stay the longest. Check Fluids: Maintaining proper fluid levels is critical to keeping your car working properly during the winter. A common mistake is forgetting to replace or top-off summer windshield wiper fluid with a winter blend that will not freeze when the temperature drops. Check your antifreeze and oil levels to prevent internal damage to your car, and keep your gas tank at least halfway full to help prevent gas line freeze. Winter prep should also include an oil change. Make sure you’re not stranded in the cold with a car that won’t start. 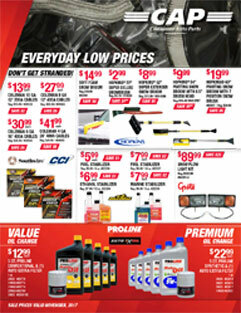 Use Marvel Mystery Oil® as an engine and fuel additive to promote better cold weather starting. Care for Your Interior: Winter elements can also cause damage to the inside of your car. When tracked-in mud, slush and snow enter your car, prevent it from staining your interior and keep your floor mats clean, use Turtle Wax® Quick & Easy ™ Interior 1 Carpet & Upholstery Cleaner. Also, be sure to remove any water-based products in containers that can freeze and crack, as well as any unnecessary items that can weigh down your car and lower fuel efficiency. Always Be Prepared: Winter can be unpredictable; so don’t wait for the first snow to fall to put the ice scraper and snow shovel in the car. Keep an emergency winter kit in the trunk in case of an accident or other bad weather situation. Recommended emergency items include a small first aid kit, flashlight, blanket, gloves, shovel, and road flares. This entry was posted in Consumer Auto Parts and tagged Auto, Auto Parts, Consumer, Coupon, Parts, Special on March 9, 2018 by contest. This entry was posted in Consumer Auto Parts and tagged Auto, Auto Parts, Coupon, driving, heat, Parts, Special on November 15, 2017 by contest. This entry was posted in Consumer Auto Parts and tagged Auto Parts, Consumer, driving, Parts, Special on November 2, 2017 by contest. Big Savings With This Coupon! $10.00 Off your next purchase of 25.00 or more. This entry was posted in Consumer Auto Parts and tagged Auto Parts, Consumer, Coupon, driving, Parts, Special on October 25, 2017 by contest. Use Heavy Duty Gel to cling to vertical surfaces. When degreasing areas under your car like differential covers or oil pans before you change out any of the functional fluids in your car. Use any one of our Brake Parts Cleaners. Dissolve and flush away built up brake dust, caliper fluid, grease and oil from the parts you’re replacing to ensure a proper fit for your new brake parts. Use Squeal Medic on your drums and rotors. Before you finish up your brake job to help stop any unwanted squeaks or squeals from starting while you brake in your new pads. Use Bug-n-Tar remover in the summer months. When most insects get stuck to your grill, bumper and hood area to keep your painted surfaces and metals free from discoloration and corrosion problems caused by insects. This entry was posted in Consumer Auto Parts and tagged Auto Parts, Consumer, Coupon, driving, Parts, Special on June 22, 2017 by contest. Just as you should check your smoke detectors’ batteries every time autumn comes around, preventive car maintenance procedures can keep automotive disaster from striking. Depending on where you live, the weather can change overnight – for instance, Colorado often gets snow as early as Labor Day. So applying the Boy Scout motto to colder-weather motoring can make the difference between getting there and back – or not. Year-round routine car maintenance is the best way to make your vehicle perform stronger and last longer. The regimen should include car tune-ups and inspection/replacement of worn belts and hoses. As the weather cools, consider changing to synthetic lubricants, which work across a wider temperature range than conventional oils. These high-tech oils cost more, so an alternative is to use lighter-weight oils in colder weather. Consult your owner’s manual for proper coolant mix, which is often about a 60/40 antifreeze-to-water ratio. Another trick is to install a higher-temperature thermostat. This will improve heater performance and help the engine warm up faster. However, some computer-controlled vehicles might not be compatible with non-factory temperature thermostats. Since the car heater and defroster work off the cooling system, check heater hoses while inspecting the radiator hoses. Coolant on the floorboard is one common sign of a leaky heater core. Also, vacuum/blow all leaves and debris out of the ducts. If your battery has removable caps, make sure that all cells are filled with distilled water. Keep all battery terminals and cable ends clean. When jump-starting, never connect the jumper cables’ ground clamp to the dead battery’s negative post. Instead, use an engine-mounted bracket as the grounding location. In colder weather, this can keep a frozen battery from exploding. Keep the gas tank as full as possible. Aside from the obvious, this limits condensation in the gas tank to minimize water – which can freeze – in the fuel line. “Antigel” additives are available, particularly for diesel-powered vehicles. On non-fuel-injected cars, keep the choke/carburetor butterfly lubricated so it won’t stick. Check the wiper blades for deterioration and consider upgrading to winter/snow blades. Park the blades before turning off the vehicle or lift them off the glass so they won’t freeze overnight. Fill the washer fluid reservoir with winter fluid, and never put hot water on a cold windshield. Waxing, particularly with a carnauba-based product, will help the paint withstand road salt and other foul-weather grime. Lubricate door hinges with silicone spray so they won’t squeak when the weather changes. Spraying the locks and weatherstripping will help keep doors and trunks from freezing shut. Air condenses in cooler weather, and we’re all well-educated now on the hazards of underinflated tires. Keep tires inflated to the manufacturer’s recommendation on the sticker found in the glove box or on the doorjamb. Check the condition/inflation of the spare. Store snow tires horizontally during the off-season to prevent flat-spotting. 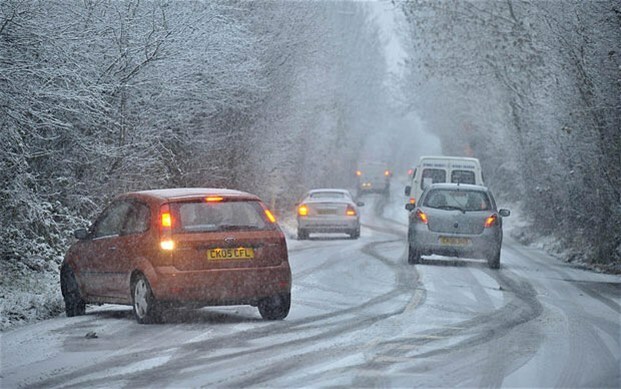 Practice fitting snow chains before the start of winter. Lastly, the automotive aftermarket unveils an array of cold-weather solutions every autumn. These products are designed to heat almost every aspect of your vehicle: from its coolant to its oil, from its battery to it locks and even its occupants. Always plan ahead to minimize the stress of cold-weather driving. This entry was posted in Consumer Auto Parts and tagged Auto, Auto Parts, Consumer, Coupon, driving, heat, Parts, Special on September 27, 2016 by contest. Save With This Coupon! 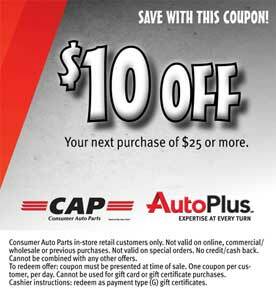 10.00 Off Your Next Purchase of $25 or more! This entry was posted in Consumer Auto Parts and tagged Auto, Auto Parts, Consumer, Coupon, Parts, Special on August 11, 2016 by contest.